The crib is Pottery Barn Kids. I scored it for free off of craigslist. Connor slept in it before his crib from Scotland arrived. We Ian then painted it white to match the changing table, which is Connor's old one. The bedding is the same bedding we used for Connor. The dresser is from Ikea. And the rocker? Another Pottery Barn Kids item I scored off craigslist. It wasn't free, but I did get it for next to nothing. It was a huge plus that it was red. All the wall shelving and picture frames are from Target. They are waiting to be filled with things after the baby is born. People gave Connor all sorts of knick knacks, so I am sure they will come in handy for little baby things. The rug is another Ikea find. The curtains are from Pottery Barn. We stole them from our house in Pasadena when our renters left a couple weeks ago. They go perfect in the room and were free...well, paid for years ago, so kind of free. So there you have it. 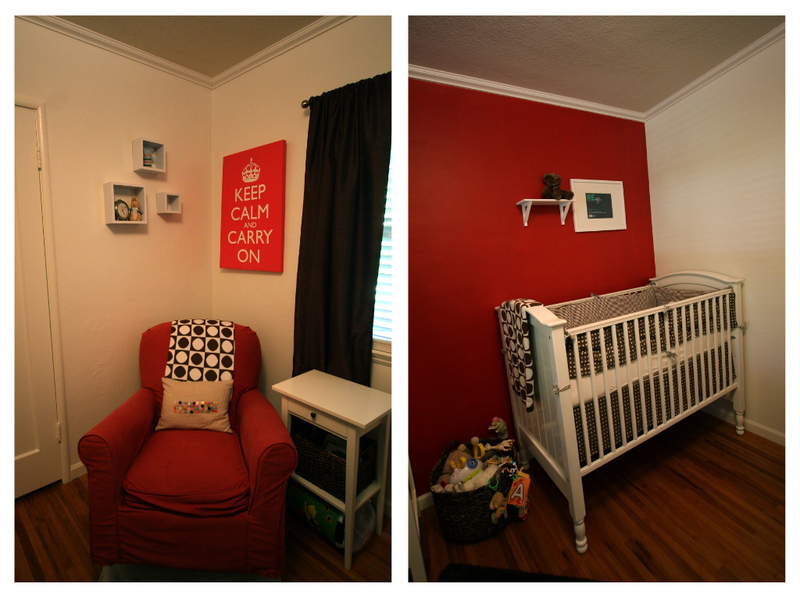 My version of a gender neutral baby's room. I am definitely happy with how it turned out and can't wait to find out if it's going to be lived in by a little boy or girl. Wow! That's such a gorgeous, well designed space! Wow! It's so... photographic. The red, white and black makes me think of a darkroom. :D I love how bold it is! This room is great! I kinda want to live in it myself. Love the asymmetrical lay of the rug. Nicely styled, lady! !